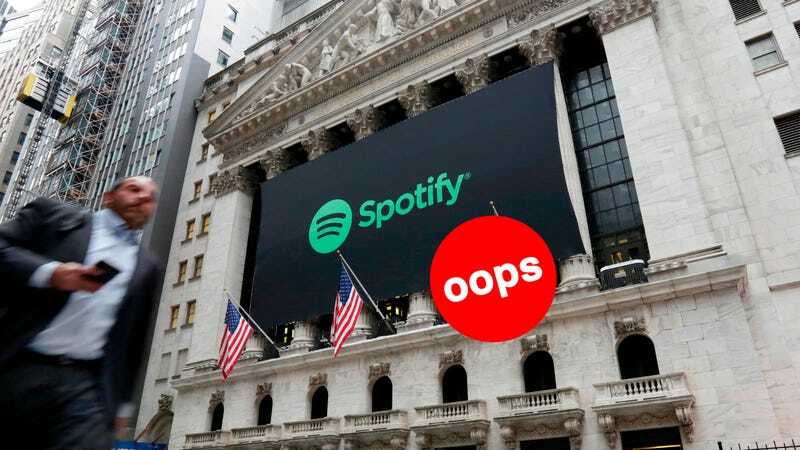 With struggling tech stocks rocking the stock market, Wall Street is watching the debut of Spotify’s unusual IPO closely on Tuesday. The New York Stock Exchange tried to give the music streaming giant a warm welcome by raising the flag of Switzerland in front of its famous building. Unfortunately, Spotify is from Sweden. Others on Twitter noticed the same thing. The NYSE confirmed the error in an email to Gizmodo. “It was a momentary ode to our neutrality in the process of price discovery,” a spokesperson wrote, clearly keeping a sense of humor about the mix-up. All was resolved in about 15 minutes according to a follow-up tweet from Carlsson, which showed the erroneous emblem replaced with the Swedish flag in front of the giant Spotify banner.